I know, I know I gushed with pride when my baby boy took his first steps (Read my reactions here), and of course I still am over the moon that my little boy is walking and growing up and yadi da. BUT…. thanks to his love for walking there are a few mummy problems that have arisen, and sometimes I wish I could revisit his good old crawling days. 1) All he wants to do is WALK! Having found that he can now independently escape any given situation, off he trots. Also the pram has become enemy number one whilst roaming out and about. 2) He wants to walk by HIMSELF. If you try to hold a hand, he will pull out a ninja warrior move and briskly remove said grasping hand. 4) He can move around undetected. This one has to be the most problematic of all! The big chunky walker meant that anyone could hear him running in your direction from a mile away. Now, his little tiny pitter patter of feet are hardly detectable. So even though you left him playing with his toys in the living room, the next time you turn your head, you will in fact find him chewing bin bags in the kitchen! 5) Sitting in the highchair, especially when out for dinner is punishment according to him. I am hoping this is simply a short-lived phase, but currently he hates sitting on the high chair during dinner. He would rather be scavenging around and under the table by himself than sit in one place and enjoy a meal! 6) Putting on shoes is World War III. As a first time mum, I underestimated the battle that is “Putting on shoes”. You would think it is the most simplest of tasks before you leave to go out, but OH NO it is equivalent to raging a war. This task is impossible with a few entertainment or distraction strategies in place, and even then getting some shoes on feet that wriggle constantly might not be accomplished. Wriggling feet are officially my new worst enemy. 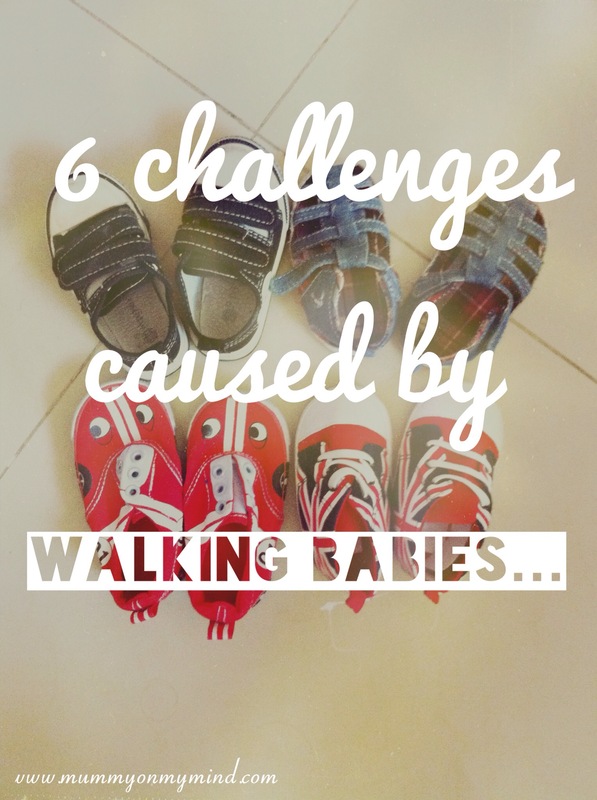 Can you relate to any of these Walking Babies challenges? Do you have any tips to tackle them, or any additions to this list that I might have missed out? Please feel free to share your thoughts in the comments section below. Aha! I remember when my girls started walking…..lol They caused utter chaos. Fun times! Haha utter chaos is the best explanation for it! Thanks for reading! ? haha when did this “stage” end for your son? Is there hope for one day getting shoes on without a tantrum?? Haha uh ohhh! Best of luck to you! And congrats on you daughter’s first steps! I was so excited at first, now I really miss the crawling stage!! Ha!